Professor Douglas McGregor highlighted that there is a significant relationship between motivation and leadership among people. He summarized the findings of the Hawthorn experiment by introducing both theory X and theory Y. It is important to note that both theory X and theory Y are based on the argument that there are specific approaches to managing people based on their traits. Workers avoid responsibilities and lack ambitions or goals. Employees are lazy, and as such, they must be threatened or forced to work. This is the modern approach to management, which emphasizes on a harmonious corporation between employees and control of the company. According to this theory, employees’ goals and those of the organization do not contradict one another. Theory Y has its fundamental concern on the satisfaction of employees. The following are some of the assumptions have in this theory. Lastly, proper working conditions help people to learn and seek responsibilities. Theory X recommends for an authoritative form of management that compels employees to achieve specific goals and objectives of the organization while theory Y recommends for a participative form of control because both company and employees’ goals are not in conflict hence the need to corporate. Theory X was highly predominant and adopted during the 20th century when autocratic leadership style was favored while theory Y and its democratic leadership style are increasingly embraced by the modern organizations. According to theory X, employees are mainly focused on financial rewards and would not work unless they are promised money and other forms of incentives whereas, employees in theory Y are motivated by non-financial rewards which include achieving organizational goals among others. Additionally, theory X states that employees have a high affinity for psychological needs and other security needs which is in contrast to the assumption of theory Y which notes that employees have a high affinity for social needs, esteem needs, and self-actualization needs. Under theory X, employees dislike work and will avoid it while at the same time trying to avoid other responsibilities associated with work. On the other hand, theory Y has a perspective that employees are self-motivated and they like work while at the same time taking duties related to work. 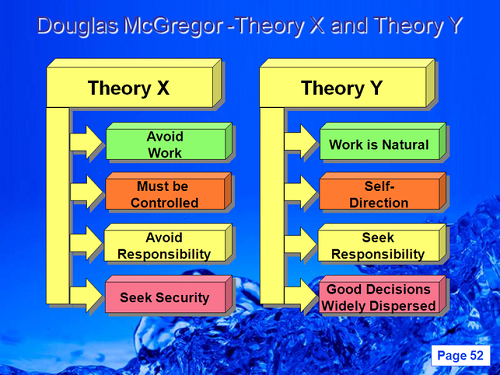 MacGregor highlighted that theory X assumes that people have little capacity for creativity and innovation, should, therefore, be subjected to routine work only while under theory Y, MacGregor notes that people are innovative and creative in nature, and should be given a chance to express their views with respect to the development of the company. Theory X assumes that workers lack self-motivation, which means that they should be continuously monitored and supervised so that they can produce optimally while theory Y implies that employees are self-motivated and self-controlled and as such, they should not be observed or supervised. According to theory X, power and authority should be centralized while at the same time having a hierarchy or chain of command upon which instructions flow whereas; theory Y focuses on decentralizing power and authority while at the same time encouraging greater participation in management decision-making process. High-level supervision required to achieve organizational goals Employees have self-control, self-direction, and therefore no external control. McGregor’s theory of motivation, which is based on the Hawthorn experiment, offers a convenient framework for analyzing the relationship between motivation and leadership style. One of the critical difference between theory Y and theory X is that employees in theory X are associated with adverse traits while employees under theory Y are associated with positive characteristics. It is believed that managers who adopted theory X produce poor results while managers who take theory Y are likely to deliver better performance while at the same time offering employees a chance to grow and develop. There is a significant relationship between McGregor theory XY and Maslow’s theory of motivation where employees at lower levels are in theory X while those high in the hierarchy are in theory Y. However, many people have criticized this theory by highlighting that no person can belong to these extreme behaviors because human being possesses the qualities of both theory X and theory Y.
Additionally, it is clear from the theory that it appears that theory X is highly related to unskilled and uneducated employees who focus on attaining psychological needs while theory Y is related to professional employees who understand their roles and responsibilities in the management of the company. Scholars propose that managers should use situational management style to generate maximum results because employees are likely to portray both negative and positive traits depending on each situation. Jecinta Morgan. "Differences Between Theory X and Theory Y." DifferenceBetween.net. November 23, 2017 < http://www.differencebetween.net/business/differences-between-theory-x-and-theory-y/ >. 1.) Is there a tie-in work Maslows Pyramid… Seems that Y people have their base needs covered and can start at Social Acceptance, while X people still need food, clothing and a roof over their heads. 2.) What happens when a Y person is managed as an X person and vis versa…What are the common reactions. Arslan, Aykut, and Selva Staub. "Theory X and Theory Y Type Leadership Behavior and its Impact on Organizational Performance: Small Business Owners in the Şishane Lighting and Chandelier District." Social and Behavioral Sciences (2013). Mohamed, Ramesh Kumar Moona Haji, and Che Supian Mohamad. "The Relationship between Management Style Contract: A Literature Review." International Journal of Academic Research in Business and Social Sciences 3.5 (2013). Russ, Travis L. "The relationship between Theory X/Y: assumptions and communication apprehension." Leadership & Organization Development Journal 34.3 (2013): pp.238-249, org/10.1108/01437731311326675.